When asked what version of Moodle they were running, 13% (3 colleges) reported running Moodle 2.4, which is the most current, stable release. The largest contingent of schools 46% (11 colleges) were running Moodle 2.3; of these 9 were running the Liberal Arts Edition. This isn’t surprising — Moodle 2.3 was released in Summer 2012, and most colleges do major Moodle point releases over the summer months (with incremental security releases during the academic year). A few schools (12%, 3 colleges) are running Moodle 2.2. A number of our member schools continue to running legacy Moodle. 30% (7 schools) were running 1.9 or older. A little more than half (58%, 14 colleges) report running some version of the Moodle: Liberal Arts Edition (LAE) released by CLAMP. 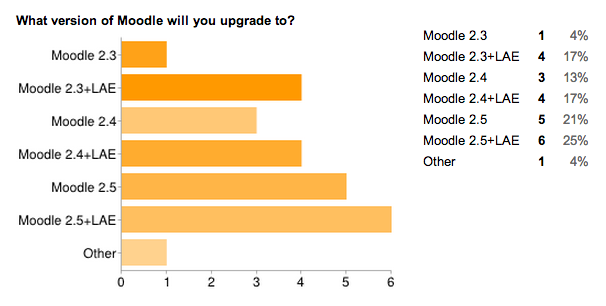 When asked what version they intended to upgrade to, five schools intend to upgrade to Moodle 2.3, while most are looking at Moodle 2.4 (30%, 7 colleges) or Moodle 2.5 (46%, 11 colleges). Those looking to upgrade to Moodle 2.3 should remember that Moodle core only supports 3 versions back; when Moodle 2.6 is released in late 2013, they will drop support for Moodle 2.3. Several schools mentioned staying on 2.4 in order to keep in step with vendor support, either plugins (Kaltura, Panopto, Turnitin) or vendor hosting (Moodlerooms). Four of the Moodle 2.5 schools were on the fence about the upgrade, and mentioned falling back to Moodle 2.4 should the latest version have problems. 58% of respondents (14 colleges) intend to upgrade to some version of the Liberal Arts Edition. 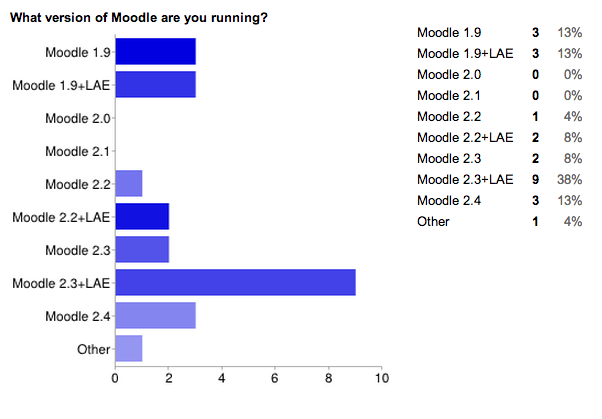 Looking ahead, the vast majority of respondents (92%, 22 schools) plan to upgrade to a newer version of Moodle in Summer 2013. One planned an upgrade for Fall 2013; one was waiting on the outcoming of Hack/Doc Fest at Colgate to decide when to upgrade. When discussing their reasons for upgrading to a particular versions, several schools mentioned drag-and-drop media (introduced in Moodle 2.3) and the Bootstrap theme (in Moodle 2.5). Other features of interest to people include grade restoration for all enrollment methods, the addition of badges, and integration with external calendars.